Ginisang Toge is a healthy vegetable dish or recipe. It is a sauteed Mung Bean Sprout with carrots, bell pepper, shrimp, and tofu. Mung Bean Sprout or Togue is a popular and major bean sprout in Asia and widely used as an ingredient in quite number of Asian dishes. Togue are normally cooked as vegetable lumpia or guinisa in Filipino households. 1). Remove head, peel off shell and tail of each shrimp. Set aside head, shell and tail. 2). Slice each shrimp at the back and remove intestine. Using pestle and mortar pound into paste the shrimp head, shell and tail. 3), Dilute paste in 1-2 cups of warm water. Pass thru a sieve to separate shells from the juice. Set aside shrimp juice. 4).. In a sauce pan, sauté garlic, onion and tomato. 5). Add shrimp, stir for 3-5 minutes or until shrimps are cooked. Add in patis and shrimp juice and cook for another 2-3 minutes. 6). Add togue, carrots and bell pepper and cook for another 2-3 minutes or until vegetables are just half cooked. This ginisang toge is best served with steamed rice and fried dish. Enjoy! 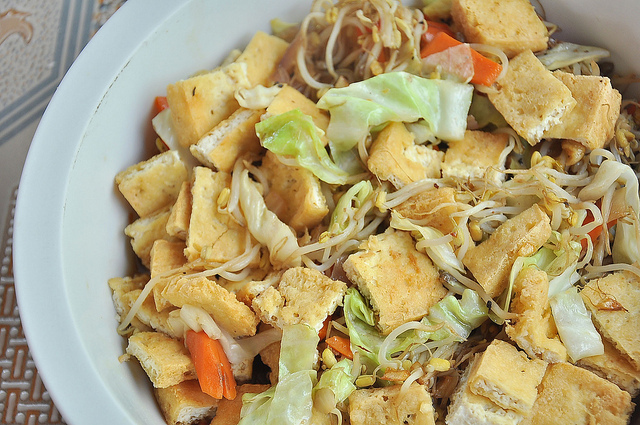 Togue And Tofu Image by AndySnaps2011 shared via Flickr under a Creative Commons license. Note: Image may vary with the end result of this recipe. Image is used for presentation purposes only.